A few weeks ago, we had dinner with friends and it centered around an epic bites, AKA Isaac Bernstein test rollout of some new and great oldies. Any excuse to try new Bernstein fare is going to be an epic experience, so I was in. With dusk slowly on its way, the cool evening air slowly coming across the valley, and the sun slowly falling into its nightly bliss, we agreed the best bet was to eat outside, Fresco style. If anyone has yet to read my previous two postings on all things Epic from Bernstein and group – please read my first dinner with him, and my own dinner that was held in my house. The funny thing about Bernstein and his crew is that they are becoming super professional and precise and I am still living in the world of 27 courses! So, when I hear 12 courses, I kind of always have a letdown. Sure, the courses are crazy complex and layered and wonderful and I have no idea how long it takes to create or source any of these dishes, but hey I am still a caveman at heart! Still, Bernstein and Epic Bites is slowly moving me away from the awe of the multiple dish madness to the awe of the depth of fewer dishes. The more time I spend with and eat Bernstein’s creations, the more I come to appreciate the effort and the time it takes to get a dish to the point where it blows me away. The sad fact is, that I am getting so spoiled that I may never be able to enjoy another dish! Maybe, Epic Bites should start the “aggressive drug dealer” (totally dinner! Where they gives away free samples of all of their dishes. Then the customers will come to see what I am now suffering from, after they have them hook line and sinker, they will never go back to another dinner anywhere else! There is an idea for the next big event!!! The first two courses were really two at once – a nice and controlled manner to get through the dinner without making it last 4 hours! The first duality were Cubes of Big Eye Tuna and compacted watermelon, with Heirloom Tomatoes, balsamic reduction, and shiso dehydrated pine nut/black olive/onion dust. But the Marilyn Monroe of this couple was served in a shot glass! 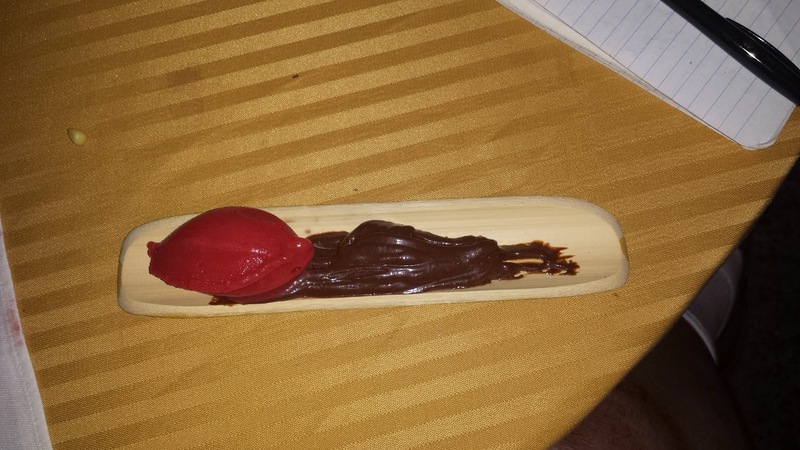 In it was a Tomato base/Avocado Sorbet covered in EVO and sprinkled with black salt. The seductress stole the spotlight for sure, but it was more than just body and soul, this vixen was creamy, sweet, salty, and acidic, all at the same time. 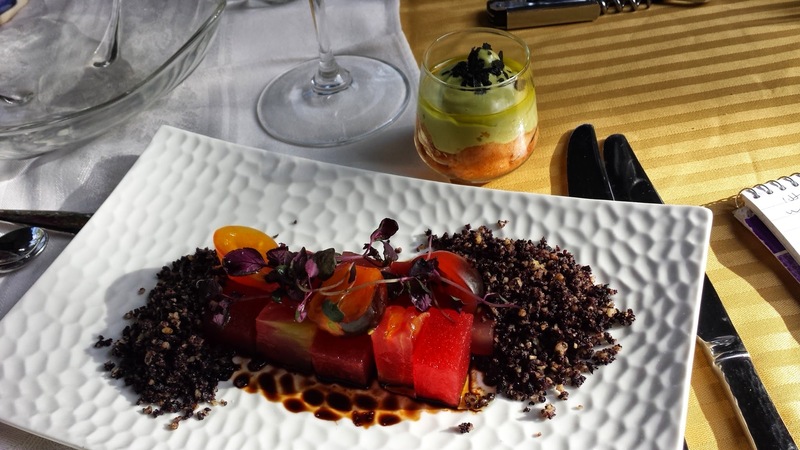 The acid from the tomatoes, balanced to sheer perfection with the green and dreamy dressed avocado sorbet, all covered in a chiffon dress of EVO and accented with black jewels of salt. BRAVO!! The Big Eye tuna and compacted watermelon was nice, it did not hit it for me, but the black dirt made up of; dehydrated pine nut, black olive, and onion was a classic tour de force for Bernstein and his gastronomical diabolic ways! I paired the course with a bottle of the 2013 Yarden Sauvignon Blanc, which continues to impress even the most cynical of kosher wine drinkers – BRAVO!!!! The next couple was two more Pisces dishes that once more showed the whimsical and technical sides of Bernstein and his crew. 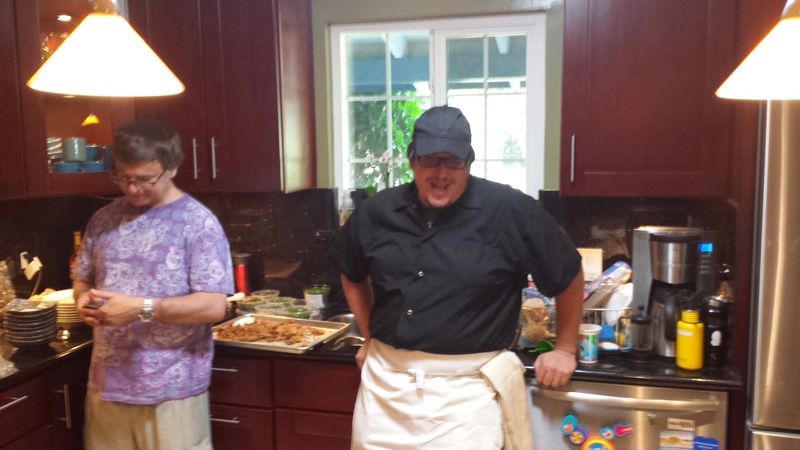 The first dish of the pair was a take on the classic Jewish dish – lox and bagel! 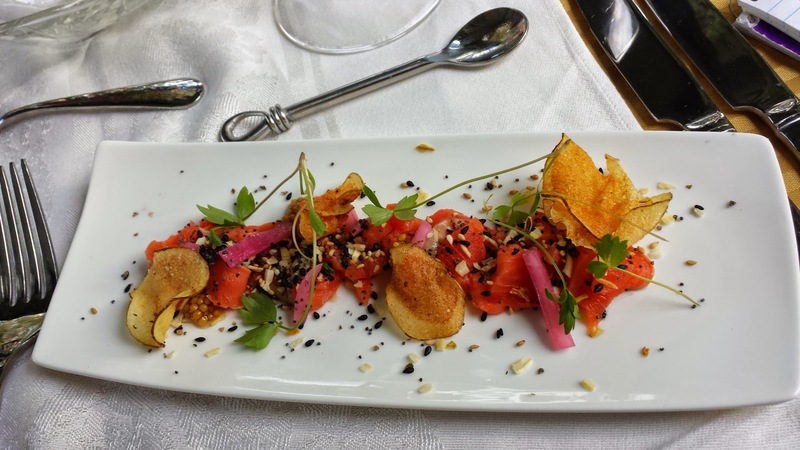 It was a Sockeye Salmon Crudo with bagel everything spice, pickled red onion, Mustard seed relish, smoked potato chips, and lovage. The dish was another home run by the mad scientist; the dish was oily and perfectly textured with enough creaminess to match the saltiness of the chips and the bitterness and sharpness from the red onion that brought the entire dish together. But the crazy element was the pickled mustard that brought more bitterness and tartness to an already complex dish with lots of levels. The pickle component just accentuated the oily and salty notes and tempered the oily and sweet notes from the beautiful fish – BRAVO! This dish was paired with the new 2013 Mensch White from Covenant, the pairing was very good, but I was not so wowed by the wine, though it is a nice enough quaff. This is the first vintage of this mevushal wine made by Covenant winery, as an entry level wine that can be served at galas and parties with your friends and family. The White made from 100% Roussanne, was nice enough, but to start it felt truly lacking, with time and serious chilling the wine came a round a bit, but not to a point of enjoyment for me. The nose on this wine is sweet and ripe, with guava, pineapple, citrus, white peach, green apple, along with litchi, fresh cut grass, and grapefruit. The mouth on this medium bodied wine hits you with quince, sweet vanilla, but it lacks the bracing acid needed to handle the sweet fruit. The finish is a bit short with nice mineral, slate, hay, and bitter notes. Overall, the wine feels short and a bit fat without the acid and depth to take it to the next level. It is a nice enough quaff. The second dish of the couple was another sorbet, but this one did not pull my mind off of the ode to the everything bagel. 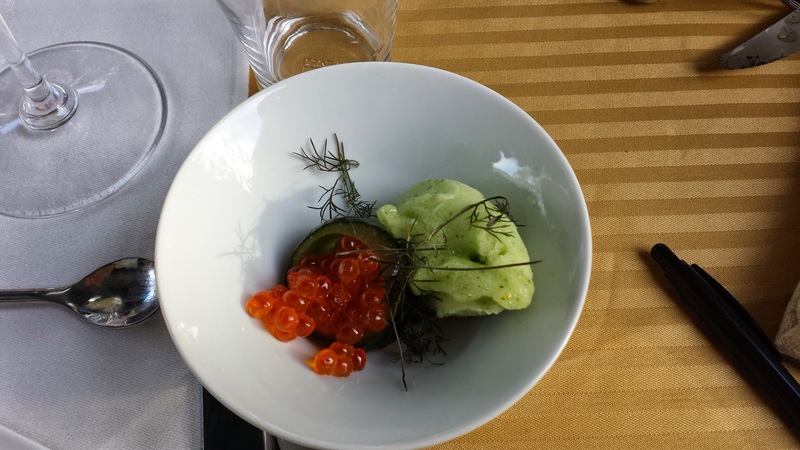 The dish was a wonderful palate cleanser of Salmon Roe, Gin Cucumber Sorbet, Gin Infused Cucumber, and Bronze Fennel. This dish was clearly innovative and was one of the true tour du force dishes that showed Bernstein’s technical skills. The Gin and cucumber sorbet was impressive, if you like that kind of stuff. The gin infused Cucumber was very impressive, as was the whole dish, nothing really took front stage, with maybe the gin being the show owner for this dish. The dish had no flaws, other than maybe gin being the star, and I am not a fan of the spirit – what can I do. Either way, BRAVO! By the way, the Salmon Roe’s stinky almost sweaty sock makeup was quite interesting, very akin to some blue cheeses I enjoy, quite shocking. The next dishes were served in singledom – being so large as they were already. The next dish was one of the most complex in terms of effort and time, with 5 separate components showcased on a single slab of red granite. This dish was an ode to the haimish dishes of those who were reared in the shadow of the Ashkenazi Americana of the 60s and 70s. These dishes were common fare on tables of Ashkenazi families all around America in the turn of the mid century, the true heyday of Jewish life for the hundred of thousands of Jewish Immigrants that came over to our shores at the turn of the century and later. 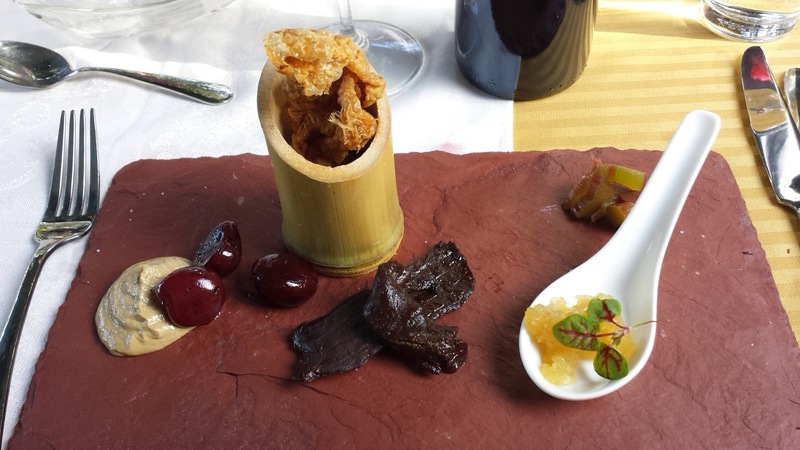 The dish was a haimish platter of appetizers with a cheeky twist of Haute Cuisine; duck liver mousse with sour pickled cherry, gribben with truffle salt, beef heart jerky, ptcha – jellied duck stuff, cured rhubarb. I will admit, as I promised Bernstein I would, I did not touch the ptcha; you could not have paid me to eat it! There, are you happy Bernie!! Now to the dish, ptcha was the only thing I did not eat, and the rest, while truly Ashkenazi in nature, was not as revolting as the Cheeky Bernstein was trying to push us towards. The duck liver mousse was one of the best dishes of the evening, I loved it! Rich, creamy, intoxicating, with a depth that shook me, while perfectly tempered from its intense richness with the pickled cherry – BRAVO!!! The gribben is a mainstay on Bernstein dishes somewhere, and truly how can you go wrong with fried chicken skin cooked in its own fat! The beef heart jerky was a new one, it is one of those meats with almost ZERO fat, so there is really very little magic that even Bernie can pull off in his mad scientist lair! Turning this meat into jerky allowed the meat to show what it has to show, while keeping it very entertaining and tasty! It was sweet, rich, salty, and mad umami with soy sauce all at the same time – wow! No more on the Ptcha. The cured rhubarb was nice, though I never did ask him its purpose. It was lovely but other than proving he can pickle and cure just about anything, I never did get the point of it, unless it too graced was showcased in Ashkenazi fare of old, but I do not remember seeing it at homes I visited, in my youth. The nose on this black colored wine was insane with ripe blackberry, eucalyptus, mint, dark plum, followed by intense dark chocolate, and spice. The mouth on this full bodied wine hits you in layers of concentrated ripe and dried fruit all at the same time, raspberry, cherry, red and black fruit, followed by intense dirt, mineral, roasted herb, all wrapped up in crazy mouth coating tannin and sweet oak. The finish is so long I could not clean my palate, with acid that seems to have been born from a lemon, yet perfectly balanced within the whole, with chocolate, oriental spice, fig, and roasted notes. BRAVO! FILTHY! This is a wine that is going nowhere anytime soon, and will be at peak very soon. Enjoy until 2018 with the peak hitting soon if not already here. 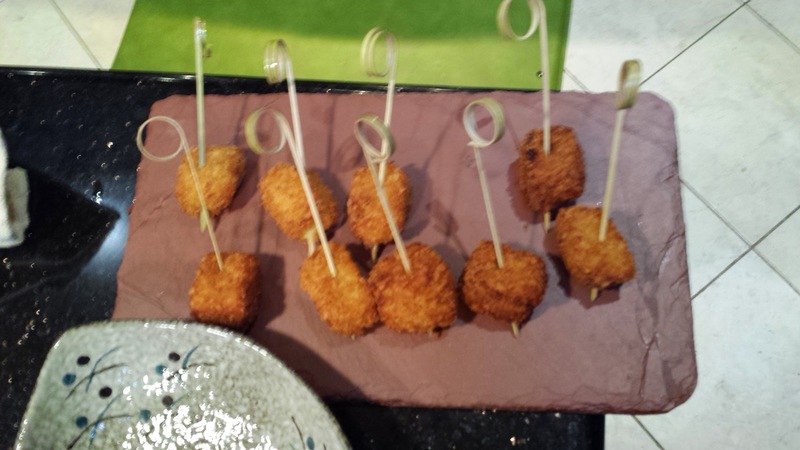 Yam fritters are one of Bernstein’s signature apps – a this incarnation was no different, rich and oily, with great crunch, balanced with a perfect level of sweetness from the yam, and enough seasoning to make the dish a classic example of how to truly elevate what most think of as frozen food dish into a culinary experience. Bravo!! One of my true Bernstein vices! With the next dish, Bernstein moved to one of my favorite fowl dishes out there – duck, and this dish was duck two ways; breast and confit – awesome! To properly label this dish – I would use a single term that I hope all can appreciate – hedonistic in Epic Bites style! The dish was officially termed; Pastured free rang duck breast, cherry glazed duck confit, potato fennel puree, roasted fennel, pickled peaches, and wild lavender. I simply termed it FILTHY! One of the best dishes – and that is saying a lot based on what was about to still grace the table! The balance of this dish was truly just the jewel atop the second seductress of the evening. The duck breast was more a Sophia Bush than just another Monroe with its rich subtlety, placed upon fluffy potato & fennel puree that just took your breath away. Without the crutch of butter, Bernstein created a masterpiece of a side dish that supported the both the subtle tones of the breast along with the straight on seductive/hedonistic tones of the confit. However, the dish would have fallen on its face without the perfect balance of the cherry glaze and pickled peaches. 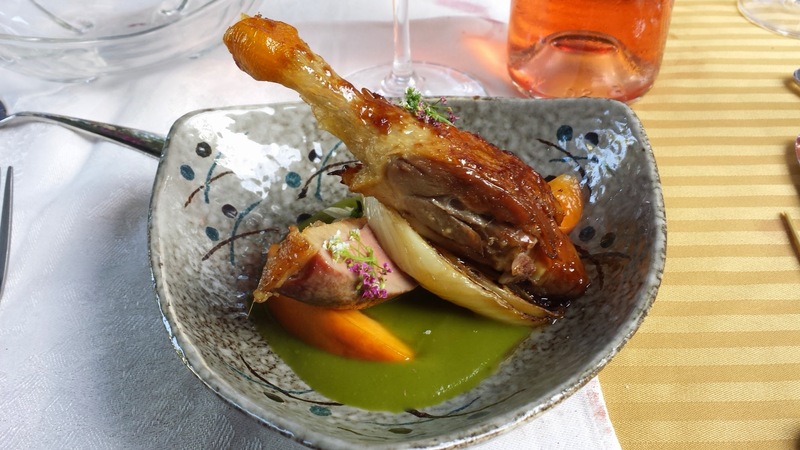 The acidic balance was truly a jewel upon the beauty – but the duck was the knockout, rich, almost buttery with just the right amount cook and bit on it – BRAVO! The flowers were a nice garnish, but the roasted fennel was what took this mad dish to classic epic bite status! The bite on the fennel gave way to the fork but was still toothsome and showed perfect technique in every way. To pair with this dish I chose a wine that in and of itself is not that great, in my opinion, but one with the right amount of bitterness to counter-balance the rich and umami laden elements. 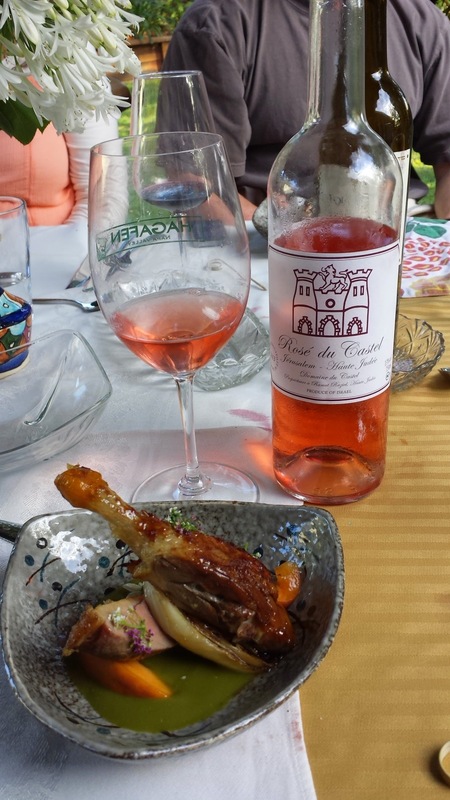 The 2013 Castel Rose is not nearly as good as previous incarnations, at least for the US label, but it was nice enough and the bitter bite at the end, was a great accompaniment to the dish. The next dish is another example by Bernstein and crew of how to hit almost hedonistic levels without the need of meat (not that I mind meat mind you!). 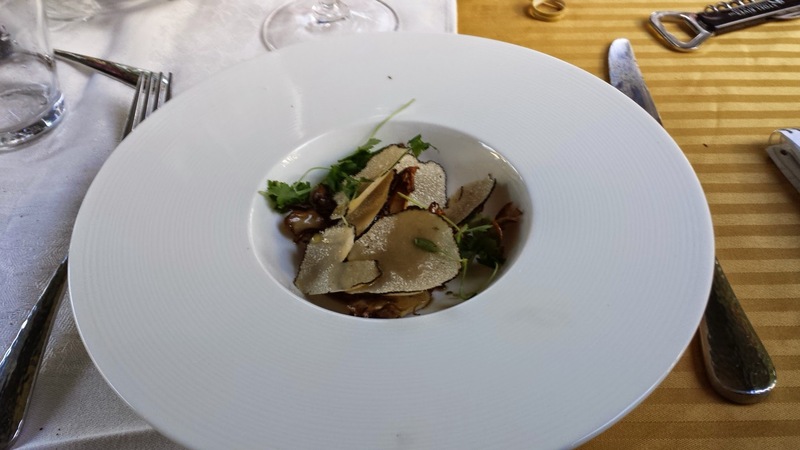 The dish was Tuber of potato, whole roasted maitake mushrooms, summer truffle, EVO, and mitsuba. To be fair some of the elements were cooked in duck fat, which does add to the hedonism of the dish, no question, but the star of this dish was the maitake mushrooms. Sure the tubers were lovely, cooked perfectly, but the mushrooms took my breath away with its layers of complexity and umami – even without the duck fat – intense and concentrated, would be the correct term that came to mind. The duck demi was clearly a component, but it did not takeover, it allowed the maitake to take center stage, while being slightly propped up to new heights by the magic elixir that is duck demi! The earthy, dirty, forage of summer truffle did add a new dimension to the dish, but without the EVO this dish would not have hit the next level – BRAVO!!! Another perfect example of balance, control, all while attempting against all will to push the dish to the next level – impressive. 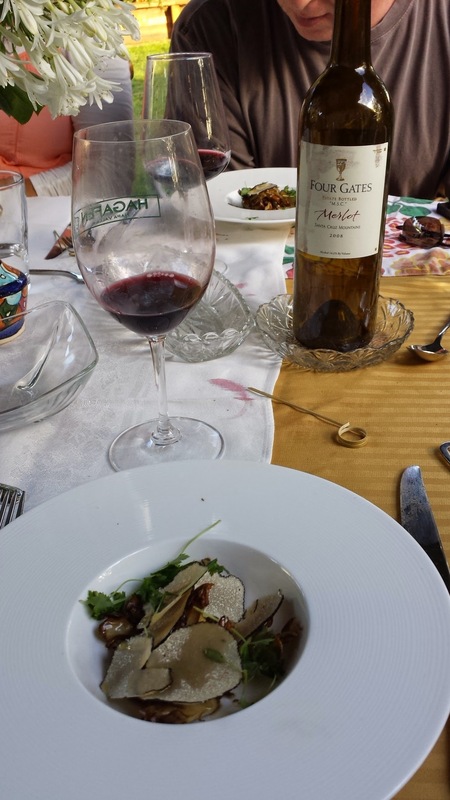 We paired this dish with the last dregs of the 2008 Four Gates M.S.C. Merlot, and what a joy that was! 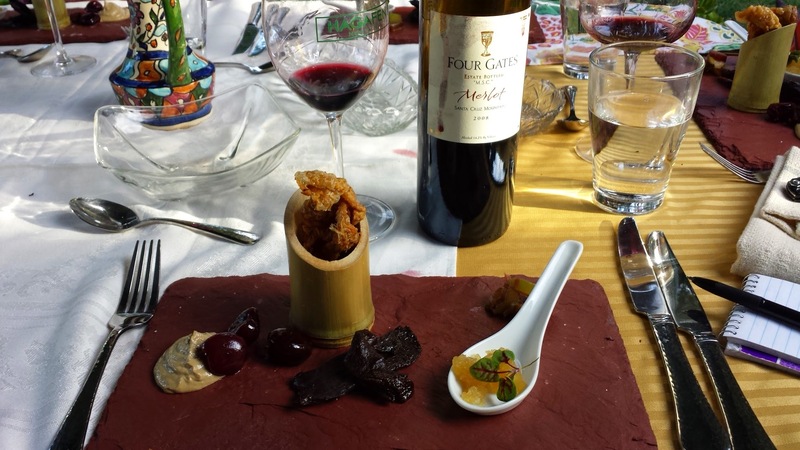 The earthy, dirty, fruit rich wine paired perfectly with the dirty/earthy qualities of the tuber dish – well the pairing was totally tuberal, sorry I could not help myself! Serving the next dish at this point of the dinner, was a gutsy move, to serve the star of the show so early in the main course section, but what can I say – it worked! The dish itself was the first of Bernstein’s ode to summer – with corn ravioli in corn cream, and smoked tomato puree, all balancing out a chuck of 60 day dry aged rib eye center – pure and epic hedonism – insane! The dish was officially called: 60 day dry aged and Togarashi cured beef rib eye, corn ravioli, corn cream, smoked tomato and onion puree and I called FILTHY! The dish screamed epic in every way, the meat was so tender I did not need a knife at all. The structure was still there without any of the funky notes that surrounded this chuck of meat after its 60 days of curing in the belly of fridge. The meat was perfect, soft, melt in your mouth perfection, but still with epic bite and structure. Still, if I were asked after a few bottles of beer or wine – which was the star of the dishes, I might find myself blurting out; smoked tomato and onion puree! Yes, sacrilege is what I am sure all the carnivores are screaming at this point – fear not, it is all about my desire for understanding the perfect balance. While the rib eye was of course the star, it and its side, the corn ravioli, would have fallen flat. The smoke and acid brought the entire dish together, with rich meaty and buttery soft notes the dish craved acid – and the smoked tomatoes gave it in spades. A bit of the three stars became hedonism at epic bite levels, but just peeking atop the seductress’s Hollywood perfect makeup was hints of the smoked tomato jewels that brought the entire image together – BRAVO!!! To pair with this wonderful dish, I brought a bottle of the 2007 Herzog Cabernet Sauvignon, One Over VII, Napa Valley. Wine friends of mine disagree with me, but I do not care, this wine is lovely. Sure it is hard to lose the vestiges of seven years of oak, but in the end, this is a classic Napa Cabernet to me. It is still balanced with enough acid, but it brings the hammer of dark fruit, butterscotch, and yes – sweet oak. I am fine with that, and so is Joe Hurrliman, the winemaker of Herzog Cellars. 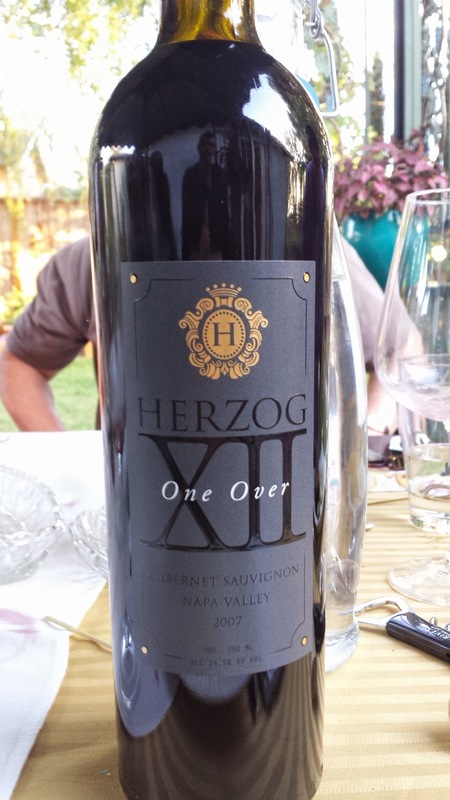 The wine was made from one of my favorite Napa Cabernets from Herzog, the 2007 Napa Cabernet Reserve. This bottle was wine that was aged for a few more years, after the bottling of the 2007 vintage, and so it is called – one over 7, an ode to the 2007 vintage that was aged a bit more for secondary and tertiary characteristics. Sure, the fruit has faded a bit, but it has not left the wine, the fruit, oak, and oak influence characteristics make for a fun wine. 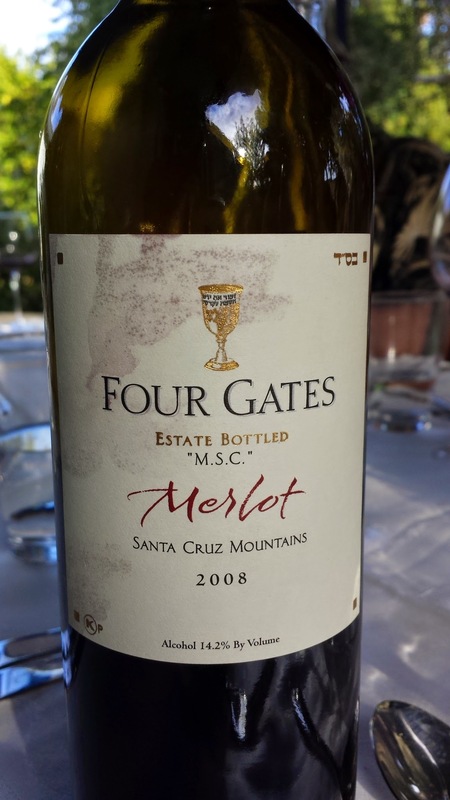 The nose on this wine is rich with wood, smokey notes, roasted meat, blackberry, plum, and cherry notes. The mouth on this full bodied wine hits you with layers of chocolate, black fruit, spice, and sweet cedar that smooths out the wine’s rough edges and accentuates the rich mouth coating tannins. The finish is long and spicy with heady spice, rich vanilla, dill, green notes, nutmeg, cinnamon, and smoke, all lingering long with a fleeting image of a man wearing a long and rich leather coat smoking sweet spices in an empty barrel while munching on bittersweet chocolate – very nice!!! To be honest – at this point my writing/notes start to turn shorter and less coherent, but the good news is that the rest of the dishes are strong in my memory – so here we go! The next, and last “official meat dish” (more on that soon) was; Coffee rubbed pastured boneless Beef short rib with potato puree, Funyuns, and braised red wine cippolini onions. This dish was another experiment in the playful side of Bernstein’s mad lab. Funyuns – really! Yup! Hilarious! The red thing that looks like a fig was actually wine braised cippolini onions and a perfect accompaniment for the rich meat and intense potato puree. Again, the puree proved you do not need butter to create a hedonistic potato side, all you need is a lab and a TON of time! The meat melted in the mouth with the softness you expect from a sous vide cookery, but with the nice crust and bite that takes your breath away. The dish may look like a classic meat and potatoes dish – but that would be a slight to this epic effort! 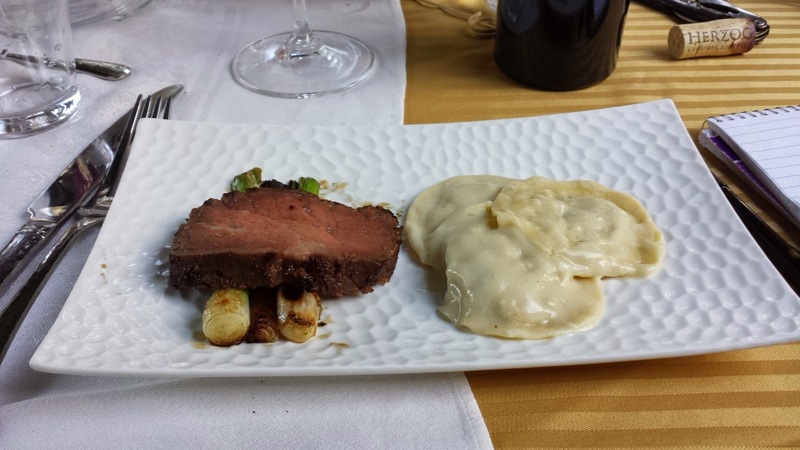 Instead, this dish come together is haut cuisine style with a creamy butter like puree, that gives way to the meat in flavor but supports its sweetness, and both are balanced by the acidic and slightly bitter wine braised onions – BRAVO!!!!! 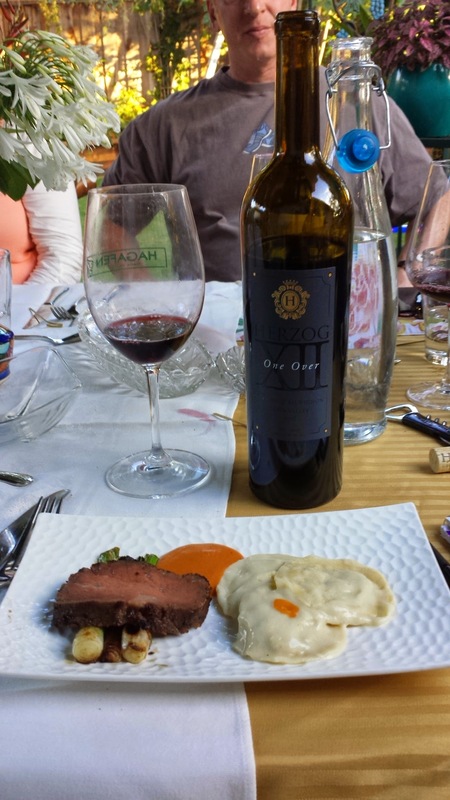 The dish was paired with more of the 2007 Herzog Cabernet Sauvignon, One Over VII, Napa Valley, which worked beautifully given the full bodied fruit/spice/leather structure. 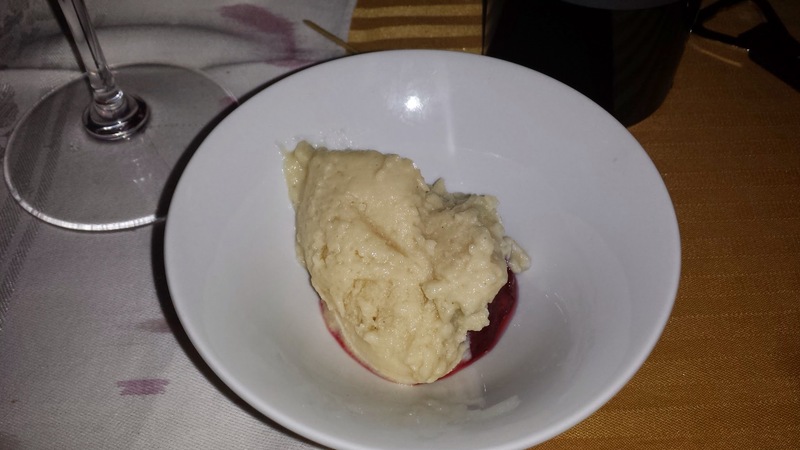 So, that officially closed out the main courses, which led us to the dessert, but we were not quite finished with meat – you see Bernstein baked the teacake in duck fat – all I have to say is FILTHY!! Seriously, this man is a madman. Just the kind of guy I want cooking food for me!!! The dish was officially called; Duck and Hazelnut “Financier” with stone fruit compote and coconut chamomile vanilla ice cream. This combo was so fantastic that I almost forgot to take a picture of the dish (sorry for the tooth marks on the pics). This dish was again a classic pairing of fat and acid. The cake was fluffy and rich, with all that duck fat, but the fat did not take center stage, rather it gave way t o the stone fruit compote which was anything but the classic “fruit compote” that brings shivers down my spine when I see it on a menu! This was so rich and tart and concentrated – it was almost jam, with a bite and kick that really shocked me! It lifted and exploded the flavors of the duck fat infused tea cake – BRAVO!!! 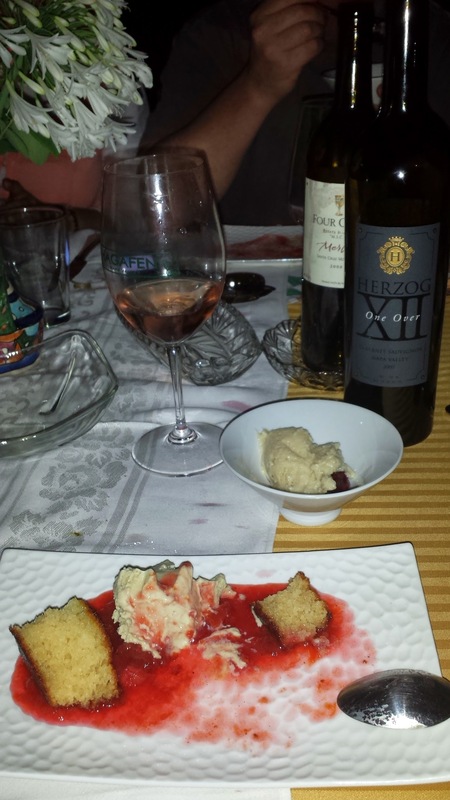 We had some dregs of the Herzog Cab with the cake. 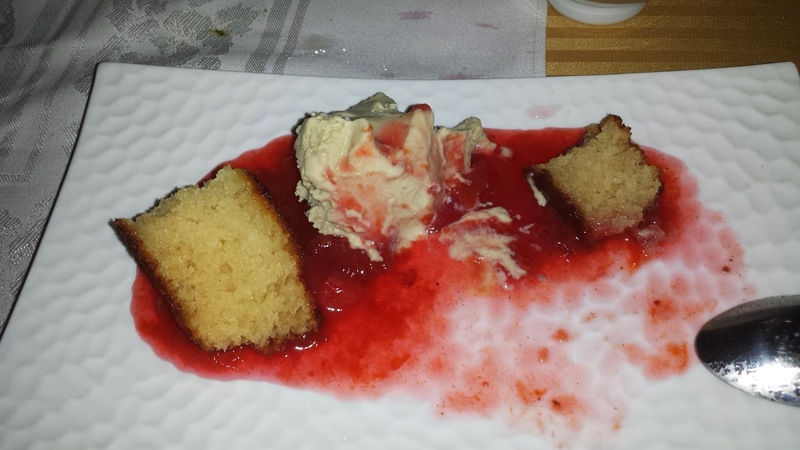 The cake and compote were accompanied with two ice cream dishes – the coconut chamomile vanilla ice cream and another dish of Sweet corn ice cream, lingonberry and huckleberry jam. The two ice creams were lovely, rich, and balanced again with the fruit stars, lingonberry and huckleberry! Wow the lingonberry season is very short – so it was a treat to get some. The final dessert dish was a Brownie puree, Strawberry sorbet, and brownie crumbs! The strawberry sorbet was frozen with a shot or two of bitters and it was the perfect balance to the sweet chocolate brownie and ripe/tart strawberry! What can I say, the man was on fire that day! Bernstein showcased the summer season beautifully with sorbet, ice cream, summer vegetables, tomato puree, and then of course proteins that were beyond reproach! Bravo my man, and I look forward, as always, to my next dinner with you and the gang! Also, PLEASE NOTE!! You can get many of these wonderful items for your next Shabbat dinner. Epic Bites is now selling many fantastic elements of these dishes that you can buy to grace YOUR kitchen and Shabbat table – so order here!!! For fun – here is the gallery of all the images from the dinner – enjoy!!!!! 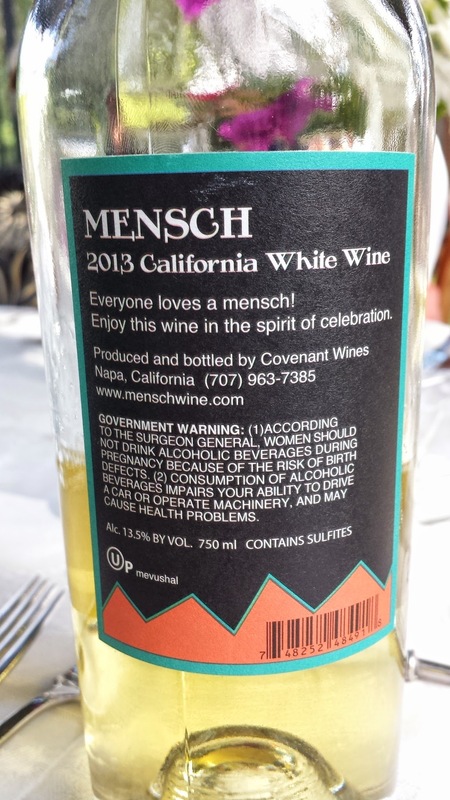 Posted on August 20, 2014, in Food and drink, Israeli Wine, Kosher Red Wine, Kosher Rose Wine, Kosher White Wine, Kosher Wine, Wine and tagged Bernstein, Cabernet Sauvignon, Epic Bites, Four Gates Winery, Herzog Cellars Winery, M.S.C., Mensch White, Merlot, Napa Valley, One Over XII. Bookmark the permalink. 2 Comments.